FLORENCE, MA - For the second time ever, on the evening of May 1 from 5:00 - 8:00 pm, FLORENCE NIGHT OUT will offer lovers of art, music, dance, film and local businesses a fun, FREE event to help usher in the spring and celebrate community. The event will start with the rite of spring dance: a May Day Maypole dance by the Marlboro Morris Men and a clog dance by the Guided Star Clog Morris troupe at the Trinity Row Triangle green at 5:00pm. Two Northampton Pedal Cabs will be available to transport people between venues all over downtown. Ed Popielarczyk of Magical Moments will be making balloon creations for kids at Trinity Row Triangle. (5:00 - 8:00). Several downtown businesses will have open houses/special promotions during the evening. All FNO events are FREE and open to the public (only VFW music performances charge a $5 cover). FNO is supported in part by a grant from the Northampton Arts Council, a local agency which is supported by the Massachusetts Cultural Council, a state agency. This event would not be possible without the Visionary Sponsors, ad sponsors, generous venue sponsors, Alison Wood and the Florence community. Thank you!" Please stop by to say hello and support this wonderful event! 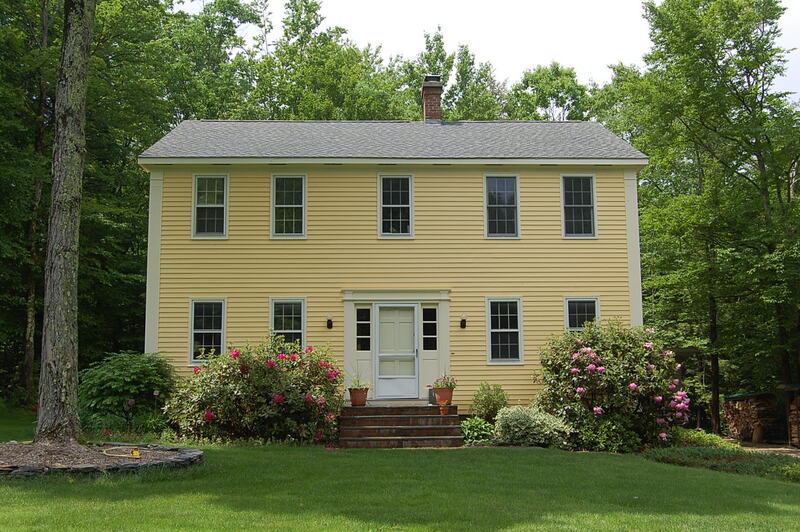 Built by Construct Associates of Northampton, MA in 1989, this gracious Victorian-inspired home sits on a bucolic 2.98 acre wooded lot - with plenty of cleared land to enjoy the out of doors - a mere 5-10 minute drive to Northampton center. Maple Ridge Road is a beautiful road with large, private lots which ends on a cul-de-sac. Number 223 Maple Ridge is just off the cul-de-sac on an upper lot with beautiful views from the upstairs porch and windows. With over 4,000 square feet of living space, 223 Maple Ridge Road has 5 bedrooms, 3 1/2 baths (including a Master Suite with walk in closet). It has a grand front porch overlooking the sweeping front yard, a deck off the kitchen from which to enjoy the backyard, a hot tub room off of the kitchen, and an open floor plan encompassing the cook's kitchen, breakfast nook and sunken living room. 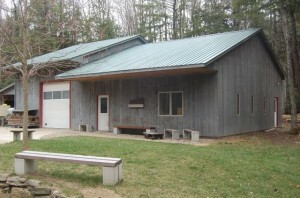 There is a 2-car garage with a covered walkway to the tiled mudroom. 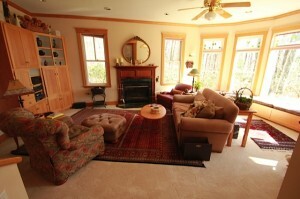 Across from the living room you will find a full dining room and sitting room which currently houses a grand piano. The attic is finished to include a guest suite, office and TV room. 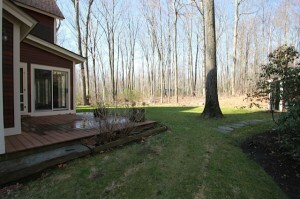 The yard has been professionally landscaped and is filled with beautiful stone work and mature trees. 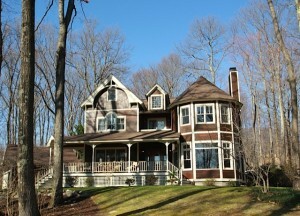 This special and beautiful home is offered for sale at $729,000. Please contact Julie Starr at juliestarr@mapleandmainrealty.com for more information. 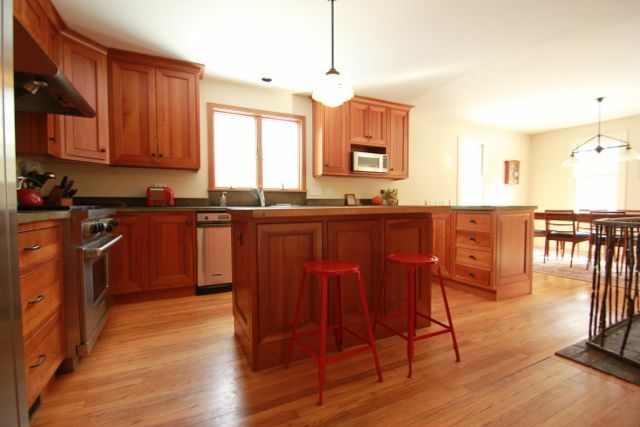 This craftsman style home was built in 1977. It has a solid frame construction, hardwood floors throughout, 3 bedrooms (including a master suite), 2 1/2 bathrooms, a cook's kitchen with cherry cabinetry, a professional range and concrete countertops. It has a detached 2-car garage, a full, dry basement, a stone patio off of the back entrance, mature fruit trees and a babbling brook on the property. The current owners have made a number of updates to the house. 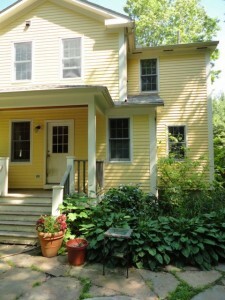 They added the mudroom, a laundry room and an additional bath, they replaced windows, renovated the kitchen, added built-ins to the study off of the living room. 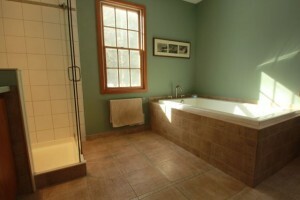 They put in an a beautiful master bathroom, pictured above. One of the owners is a furniture maker, and he has built and installed gorgeous built-ins throughout the house. 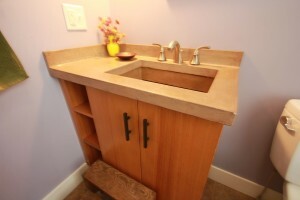 Below is an example of his work -- the poured concrete and wood fixture in the downstairs half bath. At $475,000 - this property has great value, and numerous possibilities. Please contact Julie Starr for more information or for a showing. RECYCLING EVENT this coming Saturday, April 12, from 9 until Noon at Smith Vocational High School on Locust Street sponsored by the Northampton ReUse Committee. This is the first of a series of special material recycling events coming in the Spring and Fall 2014.The materials to be collected this Saturday are: Paper Shredding Styrofoam Pellet Plastic Bags from Pellet StovesPaper ShreddingOn site secure document paper shredding will be provided by Pro-Shred of Wilbraham. Please bring only clean and dry paper. Manila folders are okay but plastic folders and page dividers are not. Shredded paper will be recycled at the event. There is a limit of two curbside recycling sized boxes. Materials that will be accepted are large pieces of white, clean and dry foam. Any paper or plastic must be removed and will not be accepted.In addition colored foam, packing peanuts and food related foam like cups, plates and trays will not be accepted. Pellet Bags Recycling Bags must be empty, dry and relatively clean. Only bags from wood pellets will be accepted. Please stack empty bags, fold them together and place the roll inside another empty pellet bag. The ReUse Committee is always looking for volunteers to help at these events. They usually require one to four hours of time on a Saturday morning. If you are interested in joining our corps of volunteers, please contact me at david.starr@comcast.net. The events are fun and social and require no previous experience. For information regarding this and upcoming recycling events please contact Susan Waite, Northampton Recycling Coordinator, with any questions 413 587 1059 or swaite@northamptonma.gov. In addition to the exciting news above.... My resources tell me that there is a drop off site in Holyoke for any unwanted paint! Latex paint can be brought to the Refuse/Recycling Drop-off Site for disposal. 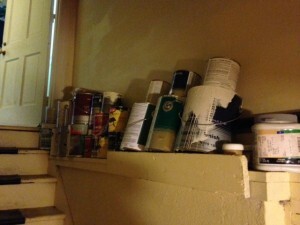 Paint swap is available for anyone interested in unused paint. Empty latex paint cans that are dried up can be brought to the Refuse/Recycling Center. Empty cans of oil-based paint must be disposed of during the City's hazardous waste day, which is held twice a year in the Spring, and Fall. Information concerning the City's Hazardous Waste Days is available by calling the DPW at 413-322-5645. We are excited to announce that two of our realtors at Maple and Main Realty LLC, have made the Boston Top 20 Realtor List for Western Massachusetts for the second time since our doors opened in March of 2013! 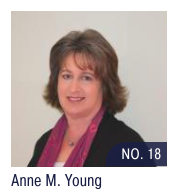 Seasoned realtors Lisa Darragh and Anne Young have both made the list again for January 2014. They were Number 10 and Number 18, respectively. 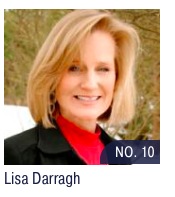 In addition, Lisa was on the list at #5 in November of 2014, and Anne was on the list at #6 in December of 2014. 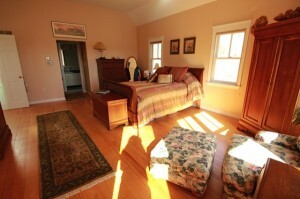 Anne and Lisa each have years of experience listing and selling real estate in the greater Northampton, MA area. As their many collective clients, both past and present, can tell you -- they are fantastic at what they do! We are proud of them, and so glad that they are a part of what makes Maple and Main Realty the unique and special place that it is.